Jason Smyth earned his second gold medal at the IPC European Athletics Championships in Swansea as he clinched the T12 200 metres title. Smyth's winning time of 21.67 seconds left him well ahead of Spanish runner Joan Munar who clocked 22.28. The Northern Irishman won the T12 100m on Tuesday after his reclassification on the eve of the championships saw him forced to move from T13 competition. Smyth, 27, achieved sprint doubles at the Beijing and London Paralympics. The Ireland team member's winning time on Thursday was .11secs outside the T12 200m world record achieved by Poland's Mateusz Michalski at the London Paralympics. 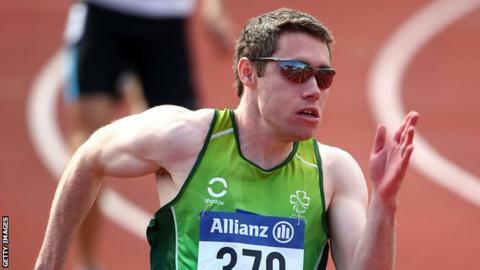 Smyth, who has a visual-impairment, has run as fast as 21.05 for 200m in Paralympic competition although he has a personal best for the event of 20.94 set at an able-bodied meeting three years ago. But despite being some way off his best form after an injury-affected season, Londonderry man Smyth was content to win another major title. "I'm happy as that was my first 200m since the Worlds last year in Lyon," said Smyth. "It was better than the 100m the other day. I came here looking to win two gold medals so I am really pleased to come here and be able to do that. "I'm probably not in the shape I would like to be in but it has been a long season with lots of niggles and issues that set me back. "But at the end of the day it is about coming here and competing and winning medals." The Eglinton athlete has dominated T13 sprinting at world level since 2006.